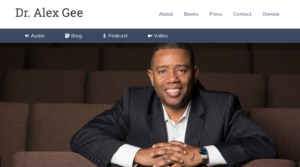 My new website, AlexGee.Com is now live!!!!!! I function in a society where I live out my public life as a pastor, author, networker, healer, social-entrepreneur, activist, coach, organizer and teacher. I love those aspects of my work. However, I am also a husband, a son, a dad, a thinker, a poet, a storyteller, a seer, an adventurist, a theologian, a muse and occasional mystic! I need a place to break out of the box of being type cast and pigeon-holed. I need sacred space to address issues that press on my heart and mind…not just my skin and culture. I have owned the need to bring all of myself to the table, one which I get to set, arrange and invite others to. This is precisely why my communications team and I have created AlexGee.Com – a place of spiritual, cultural, emotional, intellectual, professional and relational contemplation and integration. This one stop site is my place for authentically sharing myself and my ideas with the world, in hopes that people will become inspired to become their best and higher selves as they journey with me as I pursue the same. I would love nothing more than to know that my blogs, #Geeisms (my pithy inspirational insights) and soon-to-be-released podcast may become tools with which people navigate this treacherous world with hope and a renewed sense of purpose and worth.